We have recently made some changes to the website per the membership’s wishes. This includes an active forum as well as better security and privacy for members. As such you will now need a membership login to access “members only” parts of our site. This includes but is in no way limited to: Events, Meeting Calendar, Bulletins going forward, Retirements, Photos, etc. 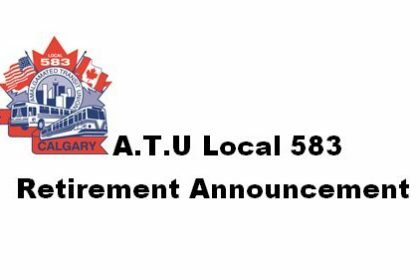 In order to sign up for our website you will need to be a member in good standing with ATU Local 583. You may sign up at www.atu583.com/members/register where you will fill out your information for approval by our Admin. Your account will be verified by your full name and employee number so please be sure this information is correct as any discrepancies may slow down/nullify your account being approved. We will do our best to get in contact with people we think have made an error. Non-members or members not in good standing will likely not be accepted. The Administrator of this website will endeavor to approve accounts within ten business days. However, often that time will be significantly shorter. If your account has not been approved and it has been longer than ten business days please get in contact with our office either by phone or via the contact form. If you have forgotten your password and you have already tried the password reset option available, please get in contact with us by one of the methods above and the Admin can generate you a temporary password. Please provide your full name, email address you signed up with and employee number to obtain a temporary password. Passwords will only be sent to the email used to sign up the account. At certain points in the ATU583.com website navigation, you may be asked to share your email address. As provided in these Terms and Conditions, such information will never be distributed to a third party and it will never be publicly visible without your express written consent. Forum Policies are available at the bottom of our homepage once you are logged in. Forum policies are non-negotiable and will be enforced for the privacy and security of our members.